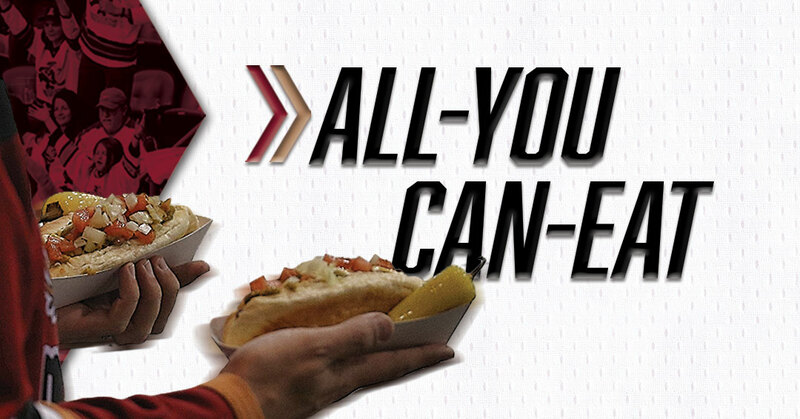 TUCSON, AZ – The Tucson Roadrunners, proud American Hockey League affiliate of the Arizona Coyotes, officially shared information today on the inclusion of “All-You-Can-Eat” nights to the 2018-19 promotional schedule. For the first time in organization history, fans will have the opportunity to purchase a ticket that comes with access to unlimited hot dogs, nachos, popcorn, soda and water for just $45. Season Ticket Members can add-on the "All-You-Can-Eat" benefits on the applicable nights for $25. Members must contact their representatives to add the option. To buy your “All-You-Can-Eat” ticket to one of the three games, click HERE. The Roadrunners return to the ice this Friday night in San Diego taking on the Gulls in an I-8 Border Rivalry game. Watch the game live at Brother John’s Beer, Bourbon & BBQ, the official watch party location of the Roadrunners, located at 1801 N. Stone Ave. in Tucson. After a three-game road set in California, the action returns to Tucson Arena next Friday night, October 19 vs. Rockford, the NHL affiliate of the Chicago Blackhawks. Fans will receive a Roadrunners 2018-19 magnetic schedule courtesy of Proforma while supplies last. The second home game of the season is also College Night and for just $25 students can purchase a package that includes one (1) ticket, two (2) drinks and one (1) Roadrunners hat with valid student ID. Purchase your package by calling 866-774-6253 or click HERE.